Over nine million parents in the U.S. are raising children without theistic religion. As we’ve seen in the past few weeks, secular families certainly do exist in Oklahoma. On Sunday June 23rd from 1:30-5:30 p.m. at the First Unitarian Church, 600 NW 13th St, there will be a free workshop called Parenting Beyond Belief, which is based on freethinking philosophy. Speaker Dale McGowan, author of “Parenting Beyond Belief” and a 2008 Harvard Humanist Award recipient, will be hosted by OKC Secular Parenting Group. Organizer Christi Dawson said the group raised funds earlier in the year to make the workshop available to other secular parents in the community. Some of the objectives of the workshop include: encouraging religious literacy without indoctrination, helping kids interact productively with a religious world, helping kids develop active moral reasoning, addressing sensitive issues with religious relatives using the principles of nonviolent communication, and more. I interviewed Christi Dawson from OKC Secular Parenting, and speaker Dale McGowan to get a better idea of what the workshop aims to provide parents who are interested in the event. I started with Dawson, because the OKC Secular Parenting Group is not only hosting the event, but inspired into being because of McGowan’s work. okc.net: When and how did the OKC Secular Parenting Group come into being? Dawson: The idea for the group was actually planted in a way by Dale McGowan himself. 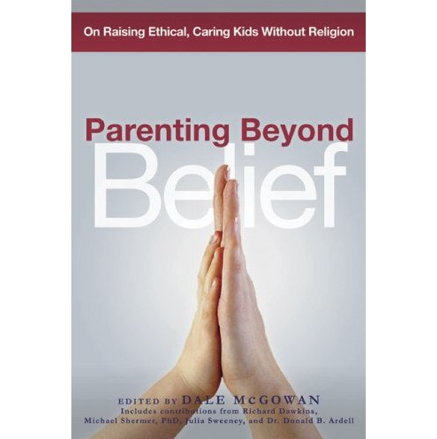 I believe I first heard about Dale and his book “Parenting Beyond Belief” in early 2010 when I saw and completed a survey online about secular parenting. Included in the survey was a question about whether you would be interested in joining a group of local secular families. I checked “yes” and shortly thereafter got a copy of the book from the library to see what it was all about. “Parenting Beyond Belief” is full of great ideas and information, but it was the final chapter, titled “Seeking Community,” that really stood out to me. As a child I had been part of a church community, but as I grew older, religious belief was something that just didn’t fit in with my view of the world. I had mostly been at peace with my lack of faith, but as I read Dale’s words in that chapter, I realized that I had been missing out on something. It wasn’t my lack of belief that had created a void, but that sense of community that the faithful are able to find in church. The more I thought about it, the more passionate I became about the idea that secular families should have an opportunity to create this kind of community for themselves. When an email went out to those who had checked “yes” on the survey and no one else was stepping forward to start one here, I decided to make it happen. The group got its informal start in the summer of 2010, and our Meetup.com page officially launched in September of that year. okc.net: Can you talk a little bit about Dale McGowan? How did you all discover him? okc.net: What obstacles do you think secular parents face when trying to raise their kids in a predominately religious region? Are there common concerns shared among the members of the OKC Secular Parenting Group or do situations tend to be family specific? Dawson: In my experience meeting and talking with many different secular families, the most common obstacle secular parents encounter in an area like Oklahoma where religion is so pervasive is facing situations where your lack of faith may cause your children to be ostracized. I hear these stories over and over. The family makes a trip to the park. The kids find another group of siblings and imagine up a great playground game. The parents, watching, strike up a conversation. Everything is going great until, almost inevitably, the question comes up: “So, where do you all go to church?” The secular parent pauses and considers how to answer, weighing a sense of integrity against the fear of where the conversation will go from here. The answer usually varies, but too often when people respond that they are not religious, the conversation ends abruptly and coincidentally it is suddenly time for the other kids to go home. This possibility is frequently there in the back of our minds, with even more at stake, as we meet the parents of a child’s best friend from school or the new kid on the basketball team. It can be really difficult worrying that your world view is going to cause problems for your child in school or social situations. Other common concerns are how to navigate co-parenting with a spouse or ex-spouse who is a believer and how to effectively communicate with religious family members about secular parenting. okc.net: What haven’t I asked about the OKC Secular Parenting Group or Dale McGowan’s speaking engagement on Parenting Beyond Belief that you’d like people to know? Dawson: Secular families are certainly a diverse group, so I can’t speak for all of our members, but I would like people to know that for many of us, and definitely for me, the goal of secular parenting isn’t to raise our children to be non-believers. It’s about raising them to have all of the tools and information about different faiths and about the amazing things that are out there in the world and then giving them the freedom to make a decision about religion for themselves. I interviewed Dale McGowan to find out a little more about him, the impetus for his book, if he’s noticed trends in his speaking engagements, and what his organization does. McGowan: Early in my own parenting I went looking for resources addressing the specific issues that come up when you raise children outside of religion — understanding moral development, dealing with death, religious literacy, rites of passage, extended family issues, community, etc — and found zilch. The intention of the book and its companion guide “Raising Freethinkers” is to help nonreligious parents find answers to those challenges without the religious framework. okc.net: I noticed Harvard awarded you as Humanist of the Year in 2008. Can you tell me about that award and if it has raised awareness for your Beyond Belief Foundation? McGowan: The award was in recognition of my work in nonreligious parent education. It’s connected me closely to the Humanist Community at Harvard, which is one of the best things going in the humanist community, just packed with good people doing great things to build a positive movement. Foundation Beyond Belief was launched more than a year later, so I’m not sure there’s much connection to the award. okc.net: What has been the impact of humanist intervention as opposed to those of the “non-proselytizing charities based in all five major world religions”? McGowan: I don’t think of them in opposition, really. They’re doing the same thing. Every worldview is at its best when it can focus its own values and perspective to make the world a better place. Religions have done this effectively for a long time. Humanists have always been just as generous and compassionate, but only recently have we begun to catch up in creating communities and organizations whose purpose is to focus and encourage that generosity and compassion — not as an incidental aspect of our lives, but as a direct expression of who we are and how we see the world. Because we do not believe in a supernatural power that can care for us, humanism is a very natural fit for compassionate action. If there’s no God, it’s up to human beings to make the world a better place. okc.net: Are you seeing measurable change in secular groups banding together to volunteer or provide other non-profit services? McGowan: Yes, there’s been a sea change in the last 3-5 years. Groups that formerly banded together around discussion, debate, and secular activism (such as church-state separation) are now making volunteering and charitable giving a bigger part of their group’s identity. okc.net: How many times do you visit overwhelmingly religious regions in the United States to give these workshops vs. those who contact you in more secular regions? I’m curious to know if you’ve seen a trend. McGowan: I’d say my trips run 3-to-1 in overwhelmingly religious regions. When I go to Connecticut, people are polite and engaged, but there’s little sense of urgency since they aren’t in the same fish-out-of-water situation. My workshops in those areas will tend to draw about 10-15 people. But when it’s Texas or Georgia or North Carolina, the workshops are 4-5 times that size, and people come with very concrete questions and issues related to the daily challenge of raising a nonreligious family in a religious culture. okc.net: Is there anything I haven’t asked that you feel is important about your up-coming speaking engagement in Oklahoma? McGowan: One of the central questions I deal with in my talks and in my workshops is whether we are raising atheists or raising freethinkers — children who will ultimately answer these big questions for themselves and know that we love and support them no matter what. I come down strongly on the latter side, and my workshops focus on how best to do that. If you would like to attend this free workshop, you’ll need to contact: okcsecularparenting@gmail.com or call 405-973-4378 to sign up. Tagged basketball, community, Dale McGowan, First Unitarian Church, Foundation Beyond Belief, Georgia, OKC Secular Parenting Group, okc.net, Organizer Christi Dawson, Parenting Beyond Belief, Raising Freethinkers, seen, writing. Bookmark the permalink.